Dr Tom Wingfield, NIHR Academic Clinical Lecturer in Infection Diseases at the University’s Institute of Infection and Global Health. “On March 24th, 1882, Robert Koch reported his discovery of the organism that causes tuberculosis (TB) to the Physiological Society of Berlin. 137 years later, we will mark World TB Day knowing that we have yet to end this global epidemic; an epidemic which kills 1.3 million people per year, the vast majority of whom are from low-income settings. The challenges we face to eliminate this disease are multiple and include: lack of an effective, long-lasting vaccine; limited access to healthcare and TB services, especially amongst the most vulnerable people; four million “missing” people with TB who are not notified or do not receive appropriate treatment; inadequate provision of therapy to prevent TB disease; rising incidence of multi-drug resistant TB in some regions of the world; and chronic underfunding of TB research at a global level. None of these challenges is insurmountable but, to overcome them and keep this global injustice high on the political agenda, concerted and collaborative international efforts and advocacy are desperately needed. While the first ever UN High Level Meeting devoted to TB in September 2018 was an important step, disappointingly, it lacked concrete commitments from governments to mobilise the resources worldwide to eradicate TB. We need to do more. In Liverpool, we have a breadth and depth of academics and professionals committed to ending TB both locally and globally, including: people affected by TB who help us to shape the care we provide and local TB research agenda going forward; the Community TB Team working with communities in Merseyside to support TB-affected people and prevent TB transmission; the multi-disciplinary teams in the Royal Liverpool and Broadgreen University Hospitals NHS Trusts Tropical and Infectious Diseases Unit treat and cure patients with TB and MDR-TB; and the LIV-TB cross-campus collaboration between the University of Liverpool and Liverpool School of Tropical Medicine (LSTM), which brings together TB researchers, from those doing laboratory work on innovative diagnostics and treatment, to those doing implementation research to address the social determinants and consequences of TB. 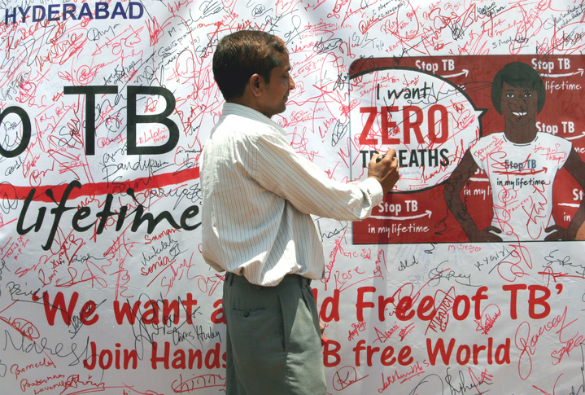 Tom and other members of the LIV-TB team make their World TB Day pledges.